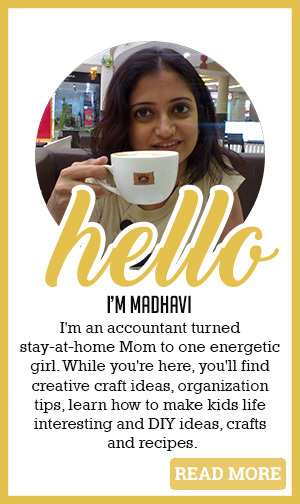 Hello All, I’m Madhavi Sivan. This is my website, where I share the arts and craft work that I do or learn from various sources, online or offline. Arts and Crafts is my passion, which I do as a hobby, and gives me a break from my day-job. ( Sorry, I don’t take any arts and crafts classes though :-) ). Currently I also have some other good folks posting to my site and sharing their art work as well. All the contents, including illustrations, text, photography and other graphics, of this website are Copyright (C) 2007-2010 Madhavi Sivan and are not to be used outside of this space, without prior written permission. I may not be able to answer any tutorial queries by email or send anything related to steps on doing things, but would be glad to respond to any questions about the blog, the content of this blog, photography or would like permission to use something you like on my site. Thanks for coming and visiting my blog. I hope you like it here and would visit again.